Few things what I remove from my and (most senior) clients computers is window decoration buttons to minimize and maximize window and I only leave (usually) the close button. As window decoration buttons are very illogical when you want to maximize or minimize window (this from new computer users standpoint) as task manager is separated from the window(s) and for user a window is the content what they use and they don't see the connection between task manager and window(s). For many the minimization function is multiple times "What happened, where is my window?" function as they don't see the connection on small button on top right corner and bottom at task manager. And you show multiple times the minimization button to minimize window to task manager and clicking task from task manager to bring it back, they ask "Why I cant just click it down there?" as they get the idea to hide window down instead closing it again but not the idea. The problem with the task manager is how it works when window is active and when it is inactive. As user does selection of active window trough task manager by clicking a inactive window but then again minimize the window to task manager when window is first active. I would like to ask about how to get a change to minimize inactive windows from task manager with single click? It is totally different what has been there since Windows 95 or System OS (don't even remember the version) since when it has been in current logic that clicking inactive window activates it (raise it front of the other window(s) and un-minimize it as well). Example I would like to see function where using mouse wheel over task on task manager would minimize window no matter is it active or inactive. And mouse wheel up would un-minimize window back no matter is task inactive or active. This way mistakenly minimizing window would not happen and left clicking would only be managing tasks position and context menu (previews by hovering etc). I don't know statics how many users use task manager to switch between windows unless they don't have access to that window at that moment (small window behind big/full screen window OR window is on other virtual desktop/activity than current one) but I believe there is a need to add new kind feature to minimize/restore windows to/from task manager other than clicking once if active window or twice if inactive. As alone making minimization only happen trough task manager has helped lots of people to understand at once the logic of task manager and that they don't need to close window everytime they want it to go "away" taking screen space and then later restarting application and working with it to return last status. In Fancy Tasks it's possible to set custom actions for tasks (including minimize, which could be set as action for left button), although only mouse buttons with optional keyboard modifiers. It looks much better. I do have a few suggestions, though (may or may not be good ones). 1. It might be better to group all the launchers to the left of the tasks, even in multi-row mode. So if you have two rows, you get two rows of launchers on the left and two rows of tasks on the right. That should make it both easier to layout and also make the launchers look more visually grouped, making it easier to identify and target them compared to the current layout. At least for me the launchers in the screenshot don't jump out at me, I have to focus my attention to find them. 2. There doesn't seem to be a button to close tasks from their thumbnails (but maybe I am remembering incorrectly and this was only ever a feature of icon tasks). 4. The thumbnail size is independent of screen size, so on my 1920x1080 laptop screen they are tiny (less than twice the size of the panel itself). 6. Launcher icons don't seem to rescale properly, they are always tiny. Also, has Icon Tasks been ported, or will it be ported? Window preview thumbnails are managed by Plasma's tooltip code, the Task Manager isn't involved with them. I'm unhappy with this layering and we're hoping to fix this in Plasma 2, allowing the applet to do more. Icon Tasks does it by forking/reimplementing substantial amounts of core Plasma C++ code, which would have been a bit silly to do in a QML rewrite :). Please file a bug ticket - this is likewise unlikely to be a regression because the underlying window is simply a Plasma dialog, and I'm skeptical of the chances of an easy applet-side fix, but it's worth investigating. > Also, has Icon Tasks been ported, or will it be ported? There was a QML desktop container proof of concept. Where's that proof of concept going? The current desktop has some serious limitations and the PoC as is was very useful. Will that proof of concept be expanded? Can we have a QML desktop containment in PW1, while we wait for the real goodies in PW2? Sebastian Kügler has been rocking away on the QML new desktop containment. I believe he's focused on Plasma 2 at this point, though ... I'll ring him to chime in here. 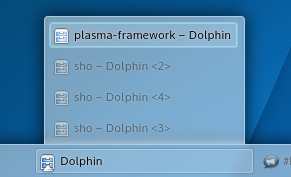 The focus has shifted to Plasma 2, however, and this particular containment has already been ported to work with Plasma Workspaces 2. It's likely going to be the default there. In fact, I noticed some issues I had with the QML desktop containment in KDE 4.10 (handles incorrectly sized) disappeared in KDE 4.11, so, thanks for such a good work, Sebastian. Also, the fact that in KDE 4.11 the new containment has no cashew has to be advertised properly. With minor touches, your PoC can be the default for SC 4.12, while we wait until Plasma Workspaces 2. Currently the scroll wheel switches through all windows in the taskbar, but I think a better behavior would be to have scroll up on a task widget to raise the window to the foreground and a scroll down to minimize it. This is, in my opinion, nicer than clicking because if you accidentally click on a window already on the foreground it'll minimize, while scrolling up would just keep it in the foreground (and the same for accidentally clicking or scrolling down on an already minimized window). Meh, I'll really miss the drag-to-another-workspace feature, I do use that semi-frequently. Any chance this might get re-added in subsequent 4.11.x versions?